This is an unusual (yet VERY intelligent) film that I first watched 2 yrs ago. I found it (only $3.99!!!) at Blockbuster this past weekend. I had to get it! 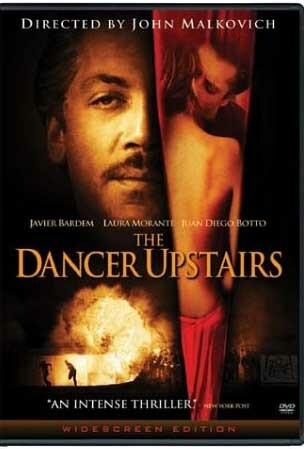 The Dancer Upstairs (released in 2002; directed by John Malkovich) is based on a book by Brit writer, Nicholas Shakespeare. His book is based on the lives of several REAL people. The movie deals with many issues: terrorism, government/police corruption, violence, family, love, and above all- the search for truth. The viewer is pulled in because of such themes; the setting is the recent past in an unnamed Latin American country. (However, those with knowledge of that area will know that the author meant to portray Peru.) This film is in English, as Malkovich wanted, but spoken by the actors as a second language. This doesn’t in any way detract from the film because these actors are SO strong. 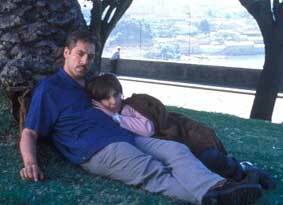 The main protagonist is Agustin Rejas (the always-fabulous Javier Bardem), a smart (reads many books), humble, and honest policeman who used to be a lawyer. He’s not the typical swaggering detective we’re familiar with; he is calm, yet determined. He has a young daughter devoted to ballet and a beautiful, but a bit superficial, wife. A recent rash of terrorist attacks, such as a little boy walking into a government building w/ a bomb in his backpack, have the military, president (unpopular w/ many; accused of crimes), and regular people in fear. All across the country, there are mysterious deaths of political leaders, military men, etc. Dead dogs are hung from posts w/ signs proclaiming “Viva el Presidente Ezequial” (the codename for an unknown terrorist leader). 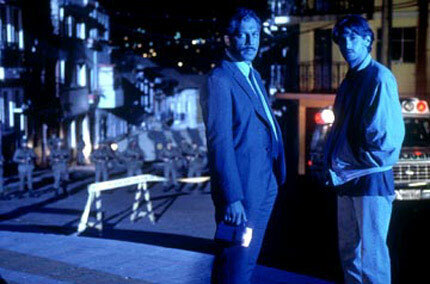 A top-ranking military man chooses Rejas (w/ a team of young, streetwise detectives) to head the investigation. They are to research the incidents, work long hrs. among a small group, and keep things hush-hush. One of the young cops (Juan Diego Botto, a boyish Cuban-American actor) serves to lighten the tension w/ his jokes, casually rumpled/quirky wardrobe, and eye for the ladies. Though he is on this tough case, Rejas is NOT getting paid extra. So, his check to his daughter’s ballet teacher, Yolanda (Laura Morante, an Italian actress whose looks and easy grace reminded me of Juliette Binoche) bounces. He goes to give her cash, feeling apologetic, and strikes up a conversation. You can tell that Rejas is intrigued by Yolanda from this first meeting; she is friendly and a good listener. Yolanda is also mysterious b/c we don’t know much about her past; she says she has traveled a lot and likes to choreograph her own dances. Rejas doesn’t tell her what he does for a living. Rejas is looking to find a honest way to make a living, he tells another character early in the story. He doesn’t like it when the military is on the streets (martial law is declared at one time). Yolanda is concerned with creative freedom, but doesn’t talk directly about her personal political views. Rejas starts to fall for Yolanda. I don’t want to write TOO much re: the action of this movie, but remember that NOT all terrorists (or those who sympathize with them) look like crazy, evil people. There is plenty of action, blood, and drama to go along with romantic tensions. I HIGHLY recommend The Dancer Upstairs.